This is a typical question I would get from players beginning to grow an interest in tennis racquets. This question as well as what is the difference between a pro stock tennis racquet and a retail one? The answer to this question is essentially: no, a pro stock racquet is not better than a retail tennis racquet. Why? Because pro stock racquets are most often customized versions of older existing retail racquets! And racquet customizations are highly personal and a racquet that is customized to fit for example Stan Wawrinka or Novak Djokovic won’t likely fit your tennis style or level of play. This is an important thing to understand. You need to play with what is best for your game, not what is best for a pro player. Pro player racquets usually have very high swing weights (they are heavy and not as head light as even fans of heavier racquets would like) and are therefore quite difficult to play with. If you can effectively swing a 360 gram racquet with a 370 swing weight effectively for hours, well then you could probably play well with a pro racquet. But if you need a little less weight to get that racquet head speed on the ball – well then you need to look for a racquet that is suitable for you. There are so many good racquets and strings on the market right now and if you start “low” you can always add lead tape and silicon to find the specs you like. And remember – a racquet is just the platform for you to find your holy grail specs. There are so many things that influence how a racquet plays such as the strings (you can choose multifilament, poly, natural gut or a hybrid! ), where you add the leap tape, what grip you choose, the shape of the grip (with some racquets you can even change the pallets on the handle to customize the grip shape) and much more. So don’t give up on a racquet just because you’re not playing your best with it. Experiment and see if you can improve it. I must add here that there are some pro stock racquets that are VERY hard to get and expensive once you do. Here are a few players (the fantastic four) and list to respective articles where you would need to do some searching to get that exact racquet or spec. Andy Murray – Andy Murray plays a pro stock racquet from Head labelled as PT57A and it is basically a 20-year-old model called Head Pro Tour 630 in a 16×19 string pattern. When you get a pro stock racquet, it comes in the form of a lighter hair pin (the racquet in raw fom) which is then customized to the players specs. Read more about Andy Murray’s racquet here. Novak Djokovic – Djokovic doesn’t use a Head Graphene Speed Touch MP although that is a decent racquet in its own right. Novak Djokovic’s racquet is something as mysterious sounding as a PT113B – which is the code for an old Head Radical model from the early 2000. It is really a 95 sq inch racquet and that’s why it a bit odd that he endorses a 100 sq inch racquet. Rafael Nadal uses a Babolat Aero Pro Drive Original (not the Babolat Pure Aero ) and that’s not too hard to find on eBay or racquet forums. Roger Federer is the only guy who uses the signature model he advertises – the Pro Staff Roger Federer Autograph . He likely uses a customized grip and some lead, but the frame is the same. 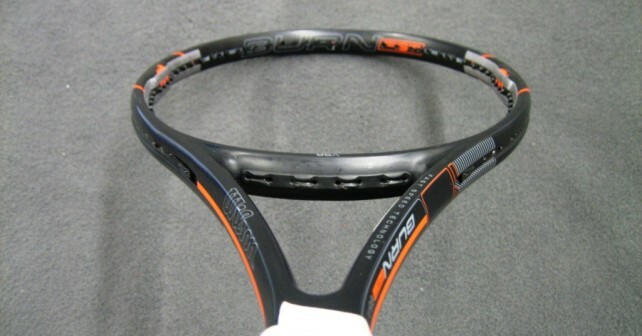 Read more about Roger Federer’s racquet here. As you can see there are a few guys that use hard-to-get racquets. But are they better racquets? Maybe for them, but like I said, a racquet is a personal thing – and you need to find what is right for you. Not an ATP touring pro with thousands of hours on the courts.